There might be people that believe somebody is talking abouta movie, when they hear the term of Highway of Death. The truth is that it was an actual road in the Middle East that was bombarded by American forces. An actual war was being fought – Gulf War –which led the United States, the U.K. and Saudi Arabia to fight the Iraqi invasion in Kuwait. Despite the fact that the Iraqi troops started to retreat, they were bombarded on their way back to their country. The entire road was closed off, with several vehicles and cars shot and burnt, becoming the Highway of Death. To this day, it isn't known how many people lost their lives. Several other countries around the world were part of the coalition, but the majority of the expenses were covered by Saudi Arabia and the U.S. Eventually, the coalition was able to bring the war to an end with the attack on the Highway of Death. The invasion of Iraq in Kuwait was condemned by the entire world, just hours after the first invasive behavior. The issue was brought before the UN and they immediately proposed and passed Resolution 600 – which called for the retreat of the Iraqi military force from Kuwait. On February 26 and 27, American forces along with Saudis were capable of stopping hundreds of Iraqi militants, who were returning from Kuwait. They did so by isolating the path they were taking, which was later known as the Highway of Death. During the combat, the Iraqi forces were able to fight back, but they didn't cause any major problems. The cost of the entire war reached the sum of $60 billion, which at least half was paid by Saudi Arabia. The war was ended by the attack on the Highway of Death. The main road that was known as the Highway of Death was actually Highway 80. This road was – and still is – a main route that connects Kuwait and Iraq. 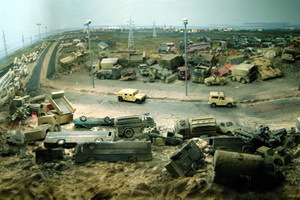 At the time of the attack, there were at least 1,400 vehicles left on site. Some of them were simply left behind by the passengers, and others caught on fire. The Highway of Death was bombarded for a period of almost 10 hours, where soldiers from the Air Force, along with the Navy and Marines attacked the Iraqi insurgents. Highway 8, which is located east of the main road, was also blocked by American forces.